Uralten, the First Time, and the Seven Sages. Hinduism has a concept of 'God' as being both un-manifest and manifest, as the One God of which the gods are projections. Most sections of Odinism do not recognise this concept, but in ancient Germania it is likely that it did exist, as I am going to try to show now. Woden is polytheistic and believes in many gods and goddesses, each with their own attributes, each being an archetype with their own archetypal myth. But we do have Woden as the All-Father, something we now must consider. Tolkien studied Germanic and Celtic Lore, as well as having researched in other Indo-European myth and legend. He based his works on this and his cosmology starts with the idea of the Illuvater also known as Eru, both seemingly meaning 'The One'. The name Illu-vater is obviously Illu-Father, a name which reminds me of 'All-Father'. I think what we need to remember here is that in Hinduism as well as Germanic Lore it is not unusual to find a god becoming the 'High God' at some stage. So Woden becomes the All-Father, achieved through his actions and his struggles. We have the name Uralten used in Germany, which is a variation of the name Wr.alda, the latter coming from the Oera Linda Book. Both would mean The Primal Old One, or The Primal Ancient One. Using the Old English we would render this Urealdan perhaps - Ur-eald-an. The Frisian Wr,alda is merely Uur-Alda which is 'Primal Old'. Significantly, in the Oera Linda Book the symbol of Wr.alda is the Yule or Yule-Wheel, a six-spoked wheel within a circle, which (it was said) the runes can be found. This I feel we should not dismiss, even though the book is obviously not historical, since it infers that the runes emanate from The One. In the Eddu Kvaedi or 'Saemund's Edda' we find Voluspa which starts it off, and whose third stanza starts with Ar var alda, a phrase repeated at the start of Helgakvida Hundingsbana ('Lay of Helgi Hundingsbane'). This phrase is usually translated as 'in olden times' or something like that. I have suggested before that I see this as a direct reference to The First Time or The Primal Time which is something like the Egyptian Zep Tepi which also means 'The First Time'. (a) The basic principles of life, nature and society were determined by the gods long ago, before the establishment of kingship. This epoch - Zep Tepi - 'the First Time' - stretched from the first stirring of the High God in the Primeval Waters to the settling of Horus upon the throne and the redemption of Osiris. All proper myths relate events or manifestations of this epoch. (b) Anything where existence or authority had to be justified or explained must be referred to the 'First Time'. This was true for natural phenomena, rituals, royal regalia, the plans of temples, magical or medical formulae, the hieroglyphic system of writing, the calendar - the whole paraphernalia of the civilisation." He gives an example of this which was that of the closing of the daily temple ritual where the priests raised a small figure of Maat - the Goddess of Law and Order - in front of the divine image. 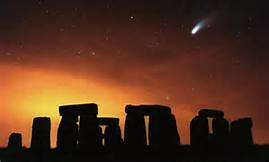 This meant that rightness and order had been re-established, but it was also a repeat of the event that took place at the beginning of the world - of some mythical happening in the time of the gods, the First Time. I have touched upon all this before, so it is not new, but it is of extreme importance in understanding ritual and why it is necessary to look more carefully into our use of it within Folkish Wodenism. What is said here is merely another way of saying that we have to reconnect to the Sacred Centre since the High God here rises with the Primeval Mound (Sacred Mountain) which arises out of the Primeval Waters. Again, this is where the Mandala of Thule comes into play, for this also is the layout of the 'First Time'. This starts at the point of the appearance of the 'High God' who can now be equated with Ur-eald-en or Uralten. He appears from the Primeval Waters on the Primeval Mountain (Su-Me-Ru) in what we can now call Ar var alda - the Primal First Time. This was the Golden Age of Perfection which we dream of a return to in our times, indeed we not only dream but we struggle to attain. This Golden Age comes to a sudden end when Osiris is slain by his brother Set. I have mentioned Sceaf as being similar to Osiris, and I have in the past linked him with Ingwe (Frey). Since Horus is the son of Osiris, and takes on his role as the Divine King then it may also be right to link Horus with Ingwe, the latter being 'The Son' and also 'The Hero-God' (Horus = Heru = Hero). Thus, we have an interesting link with Scyld Scefing who is 'Shield, Son of Sheaf' (Beowulf); Scyld would thus be the 'Hero-God', and in Beowulf it is he who arrives in a boat as the Divine Child. The Father and the Son are one - this is a typical saying in esoteric lore. There is also an interesting connection between the 'First Time' in Egyptian texts (the Edfu Texts) and what is known as the Seven Sages. The words of these Seven Sages were written down by Thoth, the God of Wisdom, and this work located certain 'sacred mounds' along the Nile. These Seven Sages appear in ancient Babylonian tradition and are said to have 'lived before the flood'; they also appear in Indian tradition as the Seven Rishis, and are said to have survived the flood. It would thus appear that these Seven Sages are enlightend beings who survive a great catastrophe (flood in this case) and start the process of rebuilding at the dawn of a new age, referred to as the 'First Time'. This does fit with what has been already said, since the arising of the Primeval Mountain from the Waters of Chaos suggests the start of a new age after a catastrophic change. This was the New Creation after the destruction of the Old World. We have the same idea in the Eddas where the Earth arises once more from the Waters of Chaos, renewed and regenerated. The same thing actually happens (in symbolism) when Noah's Ark lands on Mount Ararat (The Primeval Mountain) and the waters recede, thus a new age begins. We can also see this theme when we find the phrase Ar var alda at the beginning of the Lay of Helgi Hundingsbane since he comes at a time when one world age passes and another begins, at the time of the beginning of what is known as the Age of Iron, the Dark Age or Kali Yuga (Warg-Age). This confirms that this phrase - Ar var alda - equates with the 'First Time' or 'Primal Old Time'. In these same Edfu Texts the first manifestation of the new world took the form of a rod - 'The Perch' - on which the Divine Falcon rested. In Heliopolis there was much the same symbol, this time the Bennu (Phoenix) sat upon the pillar or column (rod). What is interesting to us is that the symbolism here is that of the Saxon Irminsul which is the Column of Irmin topped by the wings of a Swan (or other bird). The Seven Sages are known for their knowledge, wisdom and understanding, as the name suggests. Do we have any reference to them in Norse Mythology, Well, no, not directly at least; but we do have reference to the Seven Sons of Mimir who we are told awake just before Ragnarok, i.e. just before a great catastrophe that destroys the old world. These, as the name suggests, were the Seven Sons of Memory. This itself is a significant title since it does suggest that we have a group of sages who retain the Blood Memory of the Ar var alda and who arise anew before a great catastrophe and who survive in order to rebuild after the disasters. Indeed, these are the Seven Sleepers who lie asleep until awakened by the Horn of Awakening, and who take up the Seven Swords (of Wayland?) to do battle at the Ragnarok. The Heathen Teutons believed that near the ocean maelstrom (whirlpool) caused by Hvergelmer ('The Roaring Kettle') seven men slept from time immemorial under a rock. These are the Seven Sons of Mimir, who are great craftsmen (smiths) who made the weapons of the Gods. Mimir was a smith-god and his sons were smiths. It is also interesting to note that Mimir was the Wise God and the Seven Sages were known for their knowledge and wisdom. Mimir's death ensured that the World Tree, Iggdrasil, would wither and begin to die; at the same time his Seven Sons fell into a deep sleep, awaiting the time of Ragnarok when they would resurrect in order to renew the World Tree and begin a new Golden Age. The key to the awakening of the Seven Sleepers is Hama's blowing of the Giallarhorn - the Horn of Awakening. This awakens the Powers of Light to the Last Battle. * The phrase 'Ar var alda' contains 'Ar alda' which seems to be an alternative to Ur alda. ** In regard to Masonry their main symbol is the compass and square, tools of the 'builder'. This symbol is not far from our own Ing-Rune in its English version. Masonry appears, as stated, to have been a Secret Brotherhood holding the 'Secrets of Light' whose secrets were stolen by a Dark Brotherhood who slew the Divine Priest-King and stole these secrets. This seems to have been recorded in the legend of Hiram Abif. Our 'British History' tells us that the early settlers in these islands were 'non-Indo-Europeans' without a jot of evidence to prove this. Then came the Celts and finally the Germanic Tribes. But evidence that Germanic Tribes were here in Britain in very ancient times is now coming to light, and gaining ground and credibility. In this post I am going to go into another piece of evidence for this theory, based upon a tribal name noticed by Hamasson. Around 100 BCE a 'Celtic' tribe is said to have invaded an area of North Wales, this Iron Age tribe being known as the Deceangli or Deceangi, an alternative spelling being Decangli. This tribe occupied north-west and north-east Clwyd and northern Gwynedd. On a site called The History Files we find that they originally came from Ireland as part of a tribal alliance known as the Gangani or Concani who originated in the Leinster area of Northern Ireland. They appear to have moved across to the Lleyn Peninsular on the west coast of North Wales, the name possibly deriving from Laigin which is an older form of Leinster. It would appear that this tribal alliance split and part of them moved eastwards, becoming what is known as the Deceangli. The same people occupied what is now known as Anglesey where their power was destroyed by the Romans. The Roman Paulinus attacked the Deceangli on Anglesey, slew the Druids and destroyed their sacred groves. Julius Agricola later attacked the Deceangli in Anglesey, defeated them and finally subjugated this tribe under Roman rule. This post was inspired by a piece of information given to me first by my good friend Hamasson, a piece which gave a brand new meaning to this 'Celtic' tribe. I have since studied this further, and here I am going to add further proof to this theory through my own experience, living in Gwynedd for around four years, and working for a local newspaper there. 1. The name Decangli itself is clearly Roman and not Celtic so using a Celtic prefix would not apply. 2. Even so the prefix of the name Dece-angli or Dec-angli is not de- but deci- or dec-. Indeed, the prefix -angli is the Roman equivalent to -angle which they use of the Angles or English! When we consider the Welsh version of the name (and we are here concerned with Wales) it is Tegeingl. So the prefix Dece- is a Romanised version of Tege which in the Welsh Tongue means 'fair' or 'beautiful'. Thus we have the Fair Angles or the Beautiful Angles. Immediately I am reminded of the Christian Priest who when first seeing a group of Angles declared that they were Angels because of their fair appearance. The original tribal name Gangani appears to have been derived from the Welsh 'cangan' meaning 'branch', and thus suggests that they were a 'branch' of some greater nation of peoples. Although the Tegeangli were a part of this 'branch' they too split off to form their own tribe, having moved further eastwards. But what we have here seems to be a branch of the Saxon Nation or Angle Nation which moved in around 100 BCE. The Poems of Sidonius confirm that the Saxons were here in Britain around the time of Julius Caesar, so this seems to fit in with this. We here have a valid reason for the name 'Anglesey' which is Old English for Angle's Island. It is also important to note that Anglesey was the Druid stronghold, and the centre of resistance to the Romans, and it was here that this power was crushed - and this was against the Fair Angles. The term 'Druid' is used in Norse Mythology and not restricted to the 'Celts'; indeed, since again we are proving that these islands were far more Germanic than we have been told, then the Druids were part of our tradition too. These ideas seem to suggest this to be right. Caerhun (Gwynned) - the principal centre. It is also very strange to relate that it was whilst living in Gwynedd that The Hooded Man Mysteries were given to me, as well as the first steps towards the revival of the White Dragon as an English Symbol. These mysteries came to light whilst we lived on the Fairy Glen Road in Capelilo, Dwygyfylchi (pronounce that one!) which is near to Penmaenmawr between Llandudno and Bangor, with Llandudno Junction just over the Sychnant Pass. The Romans conquered parts of Wales and thus, like the area we know as England, imposed their ways upon the inhabitants. Many of the names claimed to be Welsh are actually Greco-Roman, e.g. Tacitus becomes Tegid, and the famous Myrddin (Merlin) is actually Greek for 'myriad'. In such circumstances the Deceangli were absorbed into the Roman Empire. Going back to the Welsh name Tegeingl we should break this down into Tege-Ingl and in doing so we clearly have the name Ing, as well as the title Engel used of the English Tribes or Angles. We have seen before how the Saxons honoured the god Irmin, the God of the Arya. The Saxons or Angles were of the great Aryan Race, descended from the most ancient 'Giants' (tall men) before the Great Flood - before the sinking of At-al-land. There is no evidence of the Runes being used by any of the early peoples in these islands, but again no-one has ever really bothered to investigate if these symbols were used, maybe hidden within other symbolism. What we do know was used is the Ogham which is not a set of symbols, nor a script, but seems to have been some kind of code. An Odinist Rune-Magician once suggested that Ogham may have been a coded form to hide the Runes. Whatever the case Ogham is a very simple code using horizontal lines placed on the right and left of a vertical line, and horizontal and slanted lines placed across the vertical line, plus five other symbols. Ogham is based upon a secret Tree Lore that was passed from Initiate to Initiate, thus keeping it alive through the ravages of time. There are different versions, and some seem be tainted with the Old Testament names, suggesting distortions through Middle-Eastern influence. However, this does not negate the fact that this is a valid system, and one first used by the Aryan Druids. One of the areas where the Deceangli dwelt is Gwynedd, named after the Wild-Hunter God Gwyn or Wyn. Gwyn is Gwydion is Woden, so this area was dedicated to the god Woden (or rather his namesake used in the area). Gwyn actually means 'White' and thus the area honoured the 'White God' - the name 'wyn' is perhaps close to our 'wan' which means 'pale'. Here in England we find many names corrupted from Woden, these names using the prefix Wan-. Gwyn is the son of Nudd, and thus the 'Son of the Mist'. The Decangli were thus Iron Age Germano-Celts who were said to have invaded around 100 BCE (if we are to believe the historians); they must first have been in Ireland, and a section moved across into mainland Britain, later again splitting into two. But it would seem that these people were originally akin to the English or Angles, being a part of the Germanic Nation of the Angles or Saxons. It is also perhaps significant that when Merlin discovered the Island Dragons (White Dragon and Red Dragon) fighting at the centre of Britain he removed them to Dinas Emrys in Gwynedd. This itself suggests the movement of the White Dragon into this area. Dinas Emrys is named after Emrys, a Welsh rendering of Ambrosias, but the name was originally Dinas Ffaraon which means 'Hill of the Pharaohs'. The main centre of the Deceangli was, as stated earlier, Caerhun, which was on the River Conway. The Conway Valley is the area where the DNA testing revealed the presence of a large percentage of Blood Group A. It is typical that when I pointed this out a smear-campaign was set up to stop the message hitting home. What was also significant was the cover-up which came after I made a complaint about the smear-tactics used in a front-page article; an apology was made in a couple of lines on one of the pages near the back of the paper - a typical ploy to ensure that their message got more attention, whilst the apology would not have been noticed by all but a few people. When I asked them to check who had placed the article in I was told they could not find that out, yet when asking someone who was in a position to know what goes on he told me they would have it all on the computer system. In my position it was impossible to find out who had done it. What is clearly noticeable is the colours - Black Red on White background, Black-White-Red being the ancient colours of Eternal Germania. 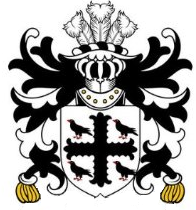 This has a 'flory' cross in black with four black choughs (**) with red beaks and red feet, and also includes four fleur-de-lys on the ends of the cross, what could originally have symbolised the Irminsul. (*) This may not be true since it was some centuries after when it was attributed to Edwin. (**) Choughs are coastal jackdaws. The above coat-of-arms clearly has the Fleur-de-Lys on the top (used in Wales) and has a more equal-armed cross. It seems clear that the Tegeangli have been remembered to this day in this area. In the first image the birds look somewhat like gulls, whilst in the above they look more like the jackdaw family; this is perhaps because they were later taken for gulls because they were the most numerous coastal birds in the area. The text of Marcellinus is not clear as to whether the Saxons were settled here or were sea-raiders since he actually mentions the Franks and Saxons attacking 'by land or by sea'. The Dicalydones or Dicaledones were perhaps the Caledonians, the Verturiones were Picts and the Attacotti were a tribe whose roots are obscure but from one legend we find that they were a Royal Clan descended through the male line from Atlas, the First King of Atlantis. We find also that a common Pictish name was Oengus or Angus which recalls Ingwe/Ingui/Ingus. These ideas give further weight to the theory that the English Folk dwelt here in these islands in ancient times. What we say will no doubt fall on deaf ears in regard to the Establishment, but our main concern should be to revise English History in order to awaken the English Folk, so what the leaders of the Establishment think or say matters not one jot. Note (added August 2016) - The area of the Tegeingl was actually known in later times by the English as 'Englefield' which clearly shows that it was occupied by the Engle-Kin or Angle-Kin.